Arizona State University’s Flexible Display Center and HP recently announced a prototype of a flexible lightweight computer screen that stands to revolutionize computers and electronic devices. Created in a similar roll-to-roll manufacturing process as thin-film pv, these new computer screens are printed onto plastic sheets that are virtually indestructible, use less energy and are less costly to produce than conventional screens. These new displays could potentially use up to 90% less materials by volume to produce as well. 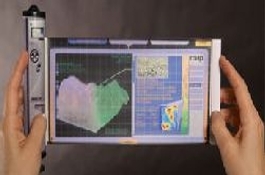 Flexible displays will not only lower the cost of monitors, but will allow the invention of more advanced and smaller electronics, like electronic paper. Devices like phones, PDAs, handheld readers, MP3 players, etc, will not only become smaller and more lightweight, but also more user friendly. Imagine actually being able to read a magazine on an handheld device and not have to scroll around to read the whole article. Or being able to stash an electronic book into your bag without destroying or scratching it. This type of screen takes the Kindle to a whole new level. Can this material be purchased yet and if so where? This would bring about a revolutionary change in the display space. The applications are far and wide, if combined with Touch tech this will be the next wave bigger than anything we have seen till date. is there a way I could voulnteer to test it? Or design the housing for it. Am VERY interested in this technology as it could 'ecologize' computer manufacturing and production. So too, that is is an innovation born in the US could put us back in the commerce saddle (and even redeem us in the eyes of the world) much like the auto. Would like to be on the list to test the laptop peripheral prototype. Could be a boon to my work as a writer. I've been hoping someone would invent this! I hate the fact that I end up wasting so much ink and paper when I make scripts... i have to print a copy of a draft for each person who needs to read the script and the director, the different members of the technical crew, etc. Something like this would be great! Arizona State University's Flexible Display Center and HP recently announced a prototype of a flexible lightweight computer screen that stands to revolutionize computers and electronic devices. Created in a similar roll-to-roll manufacturing process as thin-film pv, these new computer screens are printed onto plastic sheets that are virtually indestructible, use less energy and are less costly to produce than conventional screens. These new displays could potentially use up to 90% less materials by volume to produce as well.